A gust of cooler air breezed through, pulling Kenji from a fantasy. He looked in the direction of the door, which had just opened, closing in the wake of yet another brawny patron. Kenji’s heart beat a little harder. The man—a stranger to him–checked his weapon. Tall. Broad shoulders. Muscular chest straining against a white T-shirt. Dark, close-cropped hair, nice sideburns. This one was different. Kenji’s mouth went dry. By his clean-cut appearance Kenji guessed he was a cop. That was nothing unusual in this place. But there was something about the way he moved—deliberate—smooth, relaxed yet tightly wound, like he could spring in a second, that kept Kenji’s attention riveted. At that second, the guy looked up. His eyes made a brief yet slow survey of the crowded room. And then they landed on Kenji. Kenji couldn’t tell what color they were from this distance, but he could feel them. They seemed to burn down into his very soul. They seemed to know who he was even when Kenji himself didn’t know. Everything in the roomful of rowdy tattooed, leather-clad space junkies, space cowboys and bounty hunters receded. He was more captured than he was during one of his visions. And then he began to walk toward Kenji, his eyes never leaving Kenji’s, his brawny torso flexing with each step. Was it a few seconds or minutes before the guy stood before him, so close to his barstool that Kenji could see the dark stubble covering the strong line of his chin and jaw? So close that he caught a whiff of something spicy? Cologne that made Kenji’s groin tingle. The man pointed to the empty stool. “Is this seat taken?” He had a nice smile and incredible eyes, the color of the blue through which Kenji was falling in his recurring vision. Yet in those eyes was a touch of sadness the grin didn’t dispel. Kenji blinked. The stool next to him had been vacated within the last few seconds by the hustler sitting there. He must have gotten a hit and taken his customer to the back rooms. “I was saving it for you,” he heard himself say. And froze. What had possessed him? He’d never spoken like that to anyone. Jake Fallon looked at him a moment. A tiny grin flashed across his nicely curved lips. “I see. Well, I’ll have that too then.” He signaled the bartender, causing the muscles in his back to strain against his T-shirt. Dan came and took his order, leaving Fallon free to turn back to him. Kenji swallowed hard and stared down into the clear, bubbling water in his glass. His heart pounded and he wiped his palms off on his pants. “I’ve…never seen you here before,” he said. And almost slapped his forehead. How lame was that? Sadness flitted through the other man’s blue eyes. “I haven’t been here in a long time.” He sighed just as Dan placed his order in front of him. Fallon lifted his glass, his sad look replaced with a grin. “As we say back in Manchester, cheers,” he said, and clinked it against Kenji’s glass. Kenji remained silent and filled the moment with sipping his drink. That must be the sadness he’d seen in Fallon’s eyes. Whoever the dead man was, Fallon must have really loved him to have stayed away for so long. His fingers tightened on his own glass. “I’m sorry,” he said finally. The other man tilted his head. “You seem…different from the usual patrons here. You’re more, um, refined. Are you…” he gestured toward one of the hustlers on the other side of the bar, a guy named Pieter. Kenji looked up. Again, Fallon was so close, their lips were mere inches away. Kenji caught himself tilting in closer. Kenji jerked away. Bud had returned from the back room and now stood right behind Fallon, thumping him on the back in a rough greeting. “Hi, Bud. Long time.” Fallon swiveled on his stool and offered the other man his hand. Without giving Fallon a chance to react, Kenji slid off the barstool and started to jostle his way through the press of smelly male bodies. But before he got more than two steps away, a large hand closed gently on his shoulder, ushering him around to press lightly up against Fallon’s broad front. Kenji swallowed, finding it hard to speak for a second. He shook his head, trying to convey his agreement. Kenji had to chuckle and Fallon’s answering grin made the remaining tension in Kenji’s body relax. The next second Fallon’s grin evaporated and his eyes took on a serious look. “But, uh, if there’s any truth in what Bud said, then I’m flattered.” He squeezed Kenji’s shoulder again, the touch like a warm brand passing right through his thin white shirt and onto his skin. Kenji’s good eyelid fluttered a bit as heat invaded his body. My dear friend Amjee Bhutti, a Tibetan physician now living in Massachusetts, has recently started this organization to aid elderly Tibetans living in exile in India, people who have no one else to look after them. 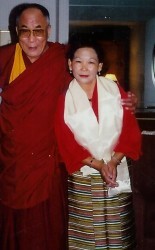 Tibet Elderly Help raises funds to benefit Tibetans who are living in India and Tibet under extremely poor conditions. Our focus is on providing physical, emotional, and spiritual aid to the elderly. With the help of your support, we are able to supply them with food, medicine, medical care, warm clothing, clean water, basic home repairs, and other necessities. On occasion we may also assist orphans, single parents, and others in these communities who need support. Tibet Elderly Help realizes that aid begins with an understanding of the issues. We work to promote such understanding by sponsoring cultural events and spreading knowledge about the challenges that face Tibetan communities and their elders. If you’d like to know more about Tibet Elderly Help, please visit their website. Thank you! I just LOVE this cover for Fantasy Thief done by artist Kanaxa. She really nailed it! I don’t have the exact release date but it’s coming VERY soon. Oh, before I forget, Acts of Passion (Ellora’s Cave) DOES have a release date: June 11, 2010! Yay! I’m so excited. That said, I’m hard at work on edits For Fallon’s Jewel (Ai Press). A couple more rounds and it will be ready for release. I’m shooting for June 1st but will keep you posted. As some of you know, I’ve been privileged enough to have awesome cover artist and photographer Les Byerley do the covers for Ai Press. He’s also done most of my covers at Ellora’s Cave. He’s incredible. I love his regular photos also. As you can see, he has such an eye for the beauty of the human form. There are many beautiful pictures like these up on his site.